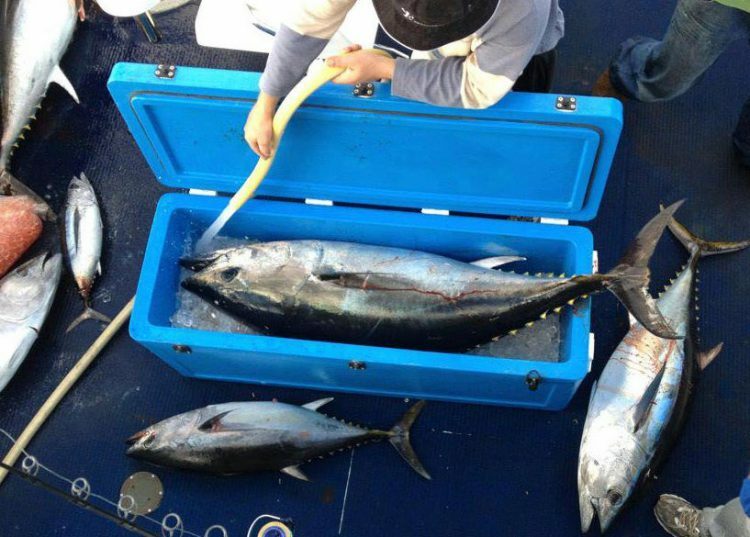 Doing a bluefin tuna charter is a winter proposition off the coast of Bermagui. Starting in the late 2000’s the annual migration of Bluefin tuna through the region has become more predictable. This ties in with a general increase in bluefin tuna numbers throughout Australia. The size and year class of the fish found off Bermagui are generally a little different to Victoria with the school fish being bigger and in large migratory schools. fish 35 kg to 60 kg are quite common and the chance of a jumbo 100kg plus fish is ever present. The fish are usually found around the seamounts and seamount line 25 to 30 nautical miles offshore. The weather is normally pretty good at this time of year with relatively calm days and sunny weather, it is still cool in the mornings though and some warm clothing is advised. Trolling is the usual searching method and once a school is located then drifting and cubing with pilchards or other oily bait over the school is normally the method used. this allows the use of all sorts of techniques like cubing , live baiting , fishing metal jigs, soft plastics, poppers and stickbaits – virtually any technique will catch a bluefin on the right day. The slow resurgence of Bluefin tuna off the NSW south coast and Bermagui has been going on for a while without anyone really knowing about it on the recreational front. We started catching bluefin in 2007 using the newly available SST data from seasurface.com which started providing plankton shots this showed us the colour changes miles offshore that we would never have known about before that. 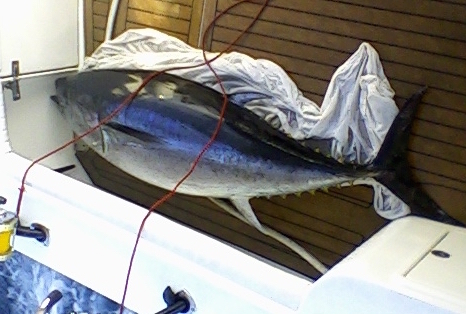 2008 also yielded good bluefin, but the belief that it was a consistent run was locked in in 2009 when a run of big fish showed up fish over a 100kg where being landed everyday – from that year onwards people starting booking charters well in advance to take advantage of the Bluefin run.